Researchers from the University of Tokyo have teamed up with members of the Japan Origami Airplane Association to develop a paper aircraft capable of surviving the flight from the International Space Station to the Earth's surface. The researchers are scheduled to begin testing the strength and heat resistance of an 8 centimeter (3.1 in) long prototype on January 17 in an ultra-high-speed wind tunnel at the University of Tokyo's Okashiwa campus (Chiba prefecture). In the tests, the origami glider -- which is shaped like the Space Shuttle and has been treated to withstand intense heat -- will be subjected to wind speeds of Mach 7, or about 8,600 kilometers (5,300 miles) per hour. A large spacecraft such as the Space Shuttle can reach speeds of up to Mach 20 (over 15,200 mph) when it re-enters the Earth's atmosphere, and friction with the air heats the outer surface to extreme temperatures. The much lighter origami aircraft, which the researchers claim will come down more slowly, is not expected to burn up on re-entry. No launch date has been set for the paper spaceplane, but Shinji Suzuki, an aerospace engineering professor at the University of Tokyo, is thinking ahead. "We hope the space station crew will write a message of peace on the plane before they launch it," says Suzuki. "We don't know where in the world the plane will land, but we hope that whoever finds it will contact us." Would make sense to have microchips or some such in the paper to record data? At least to be able to find the plane in order to know if or no it survived. Maybe they think of these things on their own. Otherwise it seems like a big waste of time. a nice idea!This paper would never be a common paper,which is supplied with more advanced appratus used to be received and sent data.But I am afraid that the paper will be burned up to 415 temperature,how can be keep fine while the paper slow up,what's the material of it? Sounds like an interesting twist on the message in a bottle game, where kids send messages downriver. you would think they could optically track it down tell you exactly where it landed. it would be more fun it send out a lot of them, they could fall over the planet and maybe the chances of recovery would be. better why one? for they money they are spending in P.R. could they make like 3,000,000 of them. This story was probably made in a hollywood basement. of course they could be made traceable. but then that's not the point of the mission is it? Why? Wouldn't humanity better be spending tons of cash on nuclear fusion instead of joking around like the world is all fine and dandy? What good is this going to do? It's art, it's poetry, it's zen. It might not make sense to us in terms of the scientific benefits - but who are we to judge? Kudos to the research team. It is interesting to note the people who criticize fun. Go figure. I'm of the opinion that as its drag in air that causes re-entry friction why does someone not use a very large drogue parachute - maybe 200 yards or bigger in diameter to slow the re-entry down to maybe 500 miles an hour. They could be made of micro-filament and dispensed with as the vehicle gets to the lower atmosphere, or am I missing something? At what altitude will it be launched? A paper airplane needs air to glide. 3 million Japanese paper airplanes fluttering to Earth at once! Kind of a cross between Pearl Harbor and 99 Luftballoons. I can hear the hysteria now. Hey! Even geeky engineers like to have a little fun and whimsy. And you might be surprised at the things you can learn and ideas you can get from seemingly useless projects. Do they smoke grass up there, man? Or do they smoke astroturf? I wonder if the exact plans for the 'spaceplane' are available anywhere, it would be cool to fold a replica. A buddy of mine skydived from the ISS one time. Nobody actually tracked him or anything, and we haven't seen him since, but trust me, he survived re-entry! It costs more to send an astronauts digesting pop tart into space in his stomach than to include a paper plane on board. The wind tunnel test cost is a few kilowatts of electricity. But you're right, we should petition to cancel this. And replace it with a energy-saving method where everyone in America donates all the art they own to their local coal-fired power plant to be burned to save $10,000 in coal. Because, hey, who needs art? It's just self-expression. It's only beauty. We could turn it into fuel! I do it a lot but damn, I'm always amazed at the new paper foldedness that everyone comes up with. a back up paper space shuttle for when NASA cant design a new one.... I can see it now each astronaut wrapped up in their own paper airplane sky diving from the ISS cause NASA cant properly spend their money. I guess on a serious note if it does work it will be cheaper than the crappy tiles they have now and easier to repair any damages.... a little Elmer's glue and a sheet of origami paper. Problem solved! How are they going to launch it? Can an astronaut provide enough delta-V to re-enter just by throwing it? I'd guess you need a few hundred metres/sec to reach the atmosphere from the space station. Maybe a catapult would be needed? A few people seem to be under the impression that the paper will need to withstand very high temperatures. This is not necessarily true. The space shuttle gets extremely hot because it is not really slowed by the thin air at the top of the atmosphere. So it gets really hot when it hits the thicker air lower down at high speed. The paper aeroplane will get slowed by the thin air, so it won't get as hot. Please don't translate the units back to US customary units, leave them in metric! The only way Americans will learn the metric system is to see it in use. I'm amazed at the amount of people who have commented without actually reading the story. Oh and what happens when it comes through the atmosphere and strikes someone in the head? This is brilliant! The use is obvious. We need cheaper reentry vehicles. These vehicles would not be designed to bring back passengers, but there are times when you have 50 (harmless) samples and would like to get one of them to a lab earth-side. First, for those who say they've never seen a paper airplane break 100MPH, that's at 1 atmosphere. Mach 7 is definitely not at 1 atmosphere. Second, for those who say it would flip, try writing a stability proof sometime. do you know how to apply inverse kinematics? can you write an equation for the Jacobian of a human elbow joint? Third, the first step is to try one small paper plane. It'll probably not work, and we'll have to try again. Eventually, we might get a working 8" plane. Some day, we might even have a meter long plane that can bring 3 ounces back to earth. Fourth, for those who think this is a high-risk project, risk is the chance of failure multiplied by the cost. The cost of throwing a paper plane from the ISS is low compared to other experiments, and we will learn quite a bit, not matter what happens. Fifth, for those who think this is a waste of money, I understand. You would have never funded the research into better clocks that eventually led to better navigation, which led to Columbus' voyages. The idea of opening a new frontier does not excite you. You would have us turn inward like the Chinese did at one point, burn your own ships, and never venture out again. You will accept a stagnant society. Based on my understanding of you, I offer one suggestion: Please commit suicide. We're better off without you. I do have common sense. This is the ultimate in KISS engineering. Imagine an astronaut who is sick, and we need to get some lab tests run. Sending a shuttle or Soyouz down is incredibly wasteful. OTOH, a paper airplane could be equipped with a tracking device (think 1-2oz GPS & transmitter) and a small sample case. We drop the plane, and it's got a 1-in-3 chance of getting the sample into the right hands, in a usable condition. So we drop 5 or 10 and hope for the best. Think of the potential when we start building larger stations & craft in space. A line of bolts could shear off, and we might not have the ability to analyze it in space. We drop one on each of 5 paper planes, and get a good idea from 2 that we recover of what happened. Were the bolts defective? Was it a fatigue issue? Were they improperly installed? Imagine a very low cost mission to a near Earth crossing object. Half a dozen paper planes could let us get a few ounces of samples on the cheap. Next Up: Paper Air plane launched from space kills man from high velocity impact. How exactly do they intend to give the plane enough delta V to put it in a decaying orbit? Its not like it's going to fall as soon as you let go of it, it'll be in roughly the same orbit as the ISS even if someone were to throw it as hard as possible. The low ballistic coefficient of a lightweight paper plane means it slows down very rapidly and hardly heats up at all. Unfortunately, it will take a very long time to fall to earth, by which time the ISS will have zipped around the earth many times. It's so small that it's nearly impossible to track. Maybe the US Military could track it with an ultra-expensive spysat, but I doubt it. I'm sure all the scientists will have thought of this - but the Earth is covered on 71% of its surface by water. Paper plane, water, methinks I spot a flaw in the plan! Still, it's a thrill to think there's a one-in-a-6-billion chance I might be the person to find a paper plane launched from outside the Earth's atmosphere! :D Closest I'd ever get to space I reckon! And people wonder why no one freaking cares about the space program. How are they going to get enough delta-V to get it to go DOWN a gravity well? Not having a huge background in the physics required for space flight, I still kind of think if they THROW IT AT THE EARTH, it's going to get there soon enough. Even from apogee with a relatively weak throw of 4m/s, it gets to earth in 30 hours, and that's ignoring any acceleration provided by gravity. What I'd like to see is for them to throw out a bucket of gravel. Can you imagine the meteor shower that would create? Can't wait!! What is the date today? Have I woken up on April 1st? Wait 'til the guys in those small texas towns see this thing coming and land. This is going to throw the whole UFO thing back a few decades! "How are they going to get enough delta-V to get it to go DOWN a gravity well? Not having a huge background in the physics required for space flight, I still kind of think if they THROW IT AT THE EARTH, it�s going to get there soon enough. Even from apogee with a relatively weak throw of 4m/s, it gets to earth in 30 hours, and that�s ignoring any acceleration provided by gravity." If the plane is simply let go, it will continue to orbit with the station. If it is thrown downwards, the plane will effectively be moving faster than the space station and the additional speed will cause the plane to rise to a higher orbit. The trick is to throw it in the opposite direction of the station's movement in order to reduce it's speed. It must be thrown hard enough that the plane's orbit decays to a point where it starts to interact with the very thin upper atmosphere. How is this to be launched, by releasing the aircraft in reverse direction from the space station at a speed high enough to slow it down? How will the aircraft be controlled? If it slows down and enters the upper atmosphere, the low density high winds will not allow the uncontrolled air surfaces to properly work. In the lower atmosphers (60 miles) the winds will tear at the paper structure. Did the engineers perform wind tunnel tests of this paper plane? Making the airplane into a sphere or a kind of geodesic dome, with a mini GPS transponder, might improve its chances for survival and capture. WTF?? How will they get it to deorbit in the first place. This idea must have been conjured up by some overworked Japanese "engineer" while lying on his back in one of those appliance boxes they call "hotels." I'd have to vote yes on this one. Low cost, low-risk, and such fun! What's not to like? This is the sort of thing that keeps the public interested in science in general and the space program in particular. I like the original idea that the experiment was not conceived as a science experiment, but as an art piece, but we can learn science-type stuff anyway. There's a certain Zen elegance about this. All the same, I'd like to see a more rigorous version, with many copies launched together, of different designs and materials and in different trajectories. Embedded reflectors could be added for radar tracking by NORAD or whoever it it that tracks all the rubbish we've left in orbit. Offer modest rewards for finders to return survivors, perhaps with a promise of return to finder after scientific analysis. Heck, print the info right on the glider, postage paid! Once we figure out how to do this right, previous suggestions for low-cost, lightweight recovery vehicles could be implemented, as well as providing a cheap way for schoolchildren to participate in space exploration. The paper airplane will be travling at the same speed as the ISS when it leaves the ISS. JUST LIKE THE SUTTLE. The Shuttle then fires it's engines to slow down so it can reenter. How is a paper airplane going to A. slow down with out engines? B. Carry enough fuel (if it has engines) to slow down enough to reenter without burning up? Hope I'm lucky enough to be flying in the A380 that runs into it as it crosses 34,000 feet. But what scientific knowledge are we getting from this experiment? The launch problem isn't difficult. An object with as much area and as low a density as a paper airplane will start into orbital decay from the extremely thin air present at the ISS altitude fairly quickly. It would be an interesting test to just set it outside with zero relative motion and watch it slowly move ahead of the station as it slows down. The terminal velocity at the ground would be as slow as any other paper airplane of the same weight so I wouldn't worry about getting hit by it. This is a great proof of concept test, even if it is probably being done for the P.R. for the KIBO module going up. I was just surfing the internet when i ran across this article. Space flight can now become a what I hoped it would be in my lifetime. at mimimal cost think about it!!!!!!!!!!!!!!!! there's lots of benifits from launching paper aeroplanes from space. If this works, possibilities of lighter, less costly space crafts will be considered (though not necaserily made of paper...) and it would get kids who like making paper aeroplanes more into science...if you really think about it, there are millions of benifits. cool but like Jeremy said it wold make sense. you cant say that when you lunch the air plans its going to survive. i could get hit by a aircraft,sun. not to menchen the earths atmospheres. 1) The planes won't need to slow down to re-enter; they'll only be doing Mach 7. 2) Think of the aerodynamic research this could save. A paper shuttle still flies the same way as a full size one. 3) Just because you can't have fun at your job, doesn't mean you can take the piss out of people working their arses off. Hmm.. Thats all fun and all really. What i want to know is how to fold the thing... I would love to throw a space-worthy plane through my house! Email me if you know.. My name @hotmail.com! Hahaha! 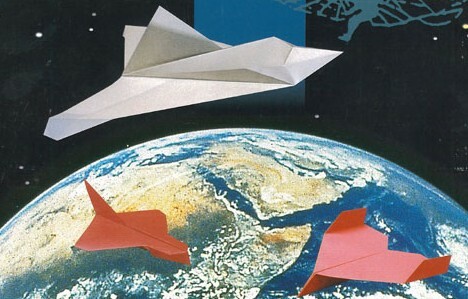 Is it really that boring up in space that they want to make paper airplanes to throw at us? I am very excited with this idea due to after almost 30 years of my paper model invention, even my model is a little tougher than the original paper airplane origami, it is quite hard for the paper to suvive the earth atmostphere unless you cover its up with specific type of chemical. Today, at my personal lab, the models have reached over 500 models and it can stand ordinary earth temperature or moisture. However, with special technique, the paper can float and not inflammable therefore this idea is correct but what the reason behind this test? Will this technique will enable some country to develop a new type of material? daily dos: wheeeeee! on mun2 :: Who's your Papi? Glorf IT - Bedenkliches aus dem IT-Alltag » Ist in Japan gerade der erste April? Technoratsi Test Server » Blog Archive » WWWoundup: How Many Ratsnakes Makes A Ton? Explosions from a Small Mind » Blog Archive » I live!!! Fogonazos » Blog Archive » �Un avi�n de papel lanzado desde el espacio?